Got mold in shower grout? Yuck! In a wet area like your shower, having a good bead of caulk in all the necessary spots is super important. After all, you certainly don’t need water getting behind the tile and causing mold or water damage. When your caulk looks good, your shower can look super clean even if your tile is old. 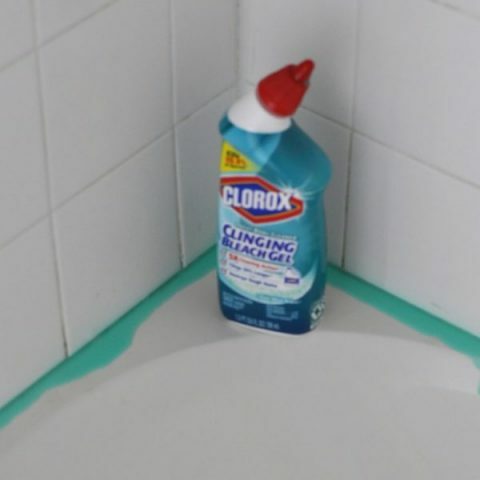 But when your caulk gets old and gross, it can also allow mold in shower grout and make the whole area look awful. Here’s a simple mold remover technique that will help you clean it up pronto. 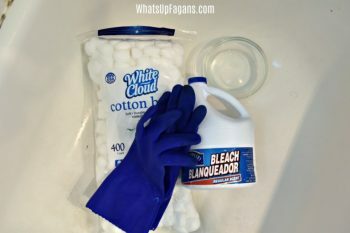 You only need some basic supplies: bleach, water, a bowl, a pair of rubber gloves, some cotton balls (or a long cotton coil for a large area), and a protective mask. Most of this mold remover stuff is probably already in your home. Are You Making a Mistake When Cleaning Your Bathtub?